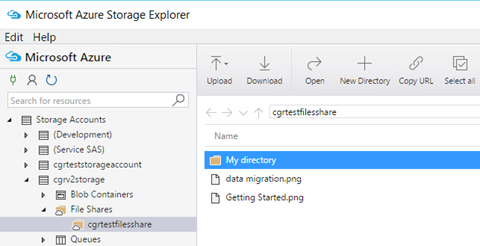 Today we're excited to share a new Microsoft Azure Storage Explorer (Preview) update with support for Azure File Shares. For this release, the focus was on making everyone more successful in connecting to Storage and improving the experience for customizing tables. We also wanted to address top user requests by allowing table export based on query results, and enabling diagnostics scenarios by displaying $logs and $metrics. Lastly, we got a lot of feedback around instabilities in downloading blobs and editing entities; we believe we’ve taken the next big step by fixing these bugs and passing on fixes from the new Node.js Storage client library (v1.0). We're happy to announce that with this update you can now interact with all Storage services, including Files. For Azure Files, you'll be able to create and delete File Shares and view their contents. You'll also be able to upload and download individual files as well as directories. Along with this, you'll have the ability to generate SAS keys or connect to File Shares using SAS URIs. We've heard from a lot of users that they wanted the ability to connect to Storage Accounts using account name and key. While we already had this feature, your feedback showed that it wasn't discoverable so we've improved this experience by making it more visible and simpler. To connect to your Storage Resources, click on "Connect to Azure Storage" icon in the Cloud Explorer tool window to open a dialog where you can paste your account keys or SAS URI. This dialog acts as a wizard, so you'll have a guided experience if we require additional information (such as the name of the account) and we will let you know additional information about the account to which you're connecting (such as what SAS permissions you have). One of the top requests for tables was the ability to export the results of a query. With this update, when you execute a query the default behavior of the "Export" button will be to only export the results of the query. When not executing a query, it will export the entire table instead. You'll also have the ability to customize the column order of your tables. You can select the "Column Options" button to manually sort and/or hide columns. If you have multiple schemas in your tables, you'll also have the ability to select a entity (or series of entities) and shift into view the columns in their schemas. Additionally, when you export tables to CSV the file will include the data type of the entities. This makes it easier to import the table back into a table, besides giving you additional information about the contents of your table. Lastly, we will now display the $logs blob container and $metrics tables for Storage Accounts on which metrics have been enabled. One known issue is that metrics tables for Premium and Blob Storage accounts are not displayed - we are working on a fix for our next update to Storage Explorer. Now that we have basic support for the four Storage Account services, Storage Explorer will shift focus slightly. Our primary concern for our summer releases will be to address your top issues (such as sign-in) and requests (managing blob leases, configuring CORS, etc.). 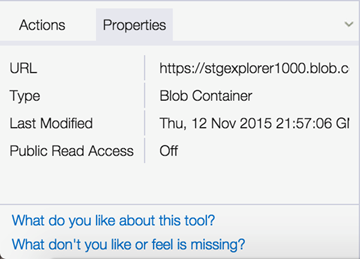 Thank you to all of those who have downloaded Storage Explorer, and to those who have sent feedback as well. Your continued support helps us guide our next big steps. As always, if you have any requests, issues, or comments, you can send us feedback from the tool.